We do our best to use images that are open source. If you feel we have used an image of yours inappropriately please let us know and we will fix it. Our writing can be punchy but we do our level best to ensure the material is accurate. If you believe we have made a mistake, please let us know. If you are planning to see an artwork, please keep in mind that while the art we cover is held in permanent collections, pieces are sometimes removed from display for renovation or traveling exhibitions. Charles Demuth certainly was not the only person to find inspiration in Provincetown, Massachusetts. Since the Pilgrims landed in Provincetown Harbor in 1620, Provincetown has been a pretty happening place. A few centuries later, artists began flocking to the small beach town to enjoy some judgement-free fun in the sun. After meeting Marsden Hartley during a trip to Paris in 1912, Demuth befriended the native New Englander, who obviously knew all the best beach spots. Hartley quickly became an important mentor to Demuth and helped him develop his art career. Along with a group of other artists, they spent a few summers there together beginning in 1916 and reveled in the queer-friendly bliss for which P-Town is still known today. 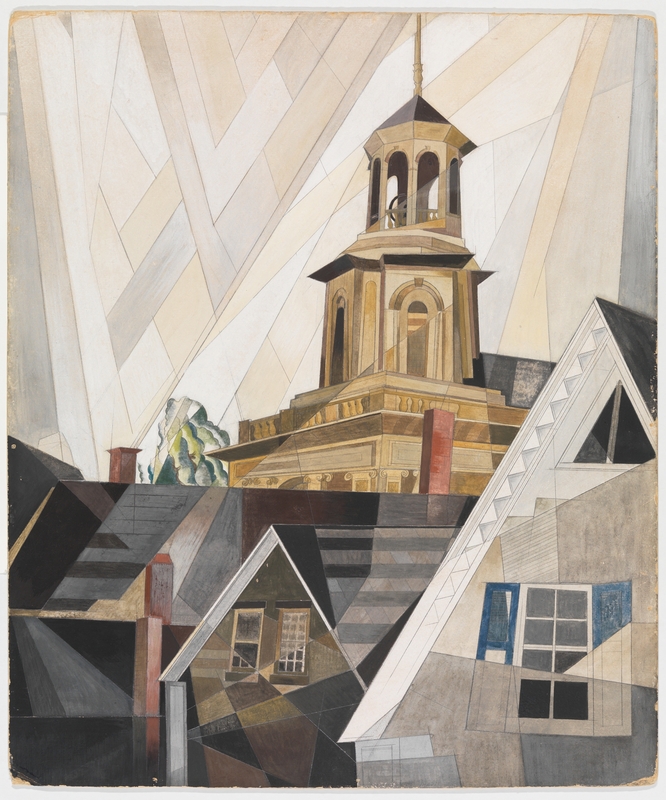 Demuth searched for distinctly American subject matter for his art across the northeastern United States and eventually zoomed in on studying the nation’s landscape and architecture. Hartley painted New England landscapes, so it was only natural for him to introduce Demuth to what he could find in this area. Demuth jumped on the opportunity to explore a region so different from the usual houses, churches, and factories in his hometown of Lancaster, Pennsylvania, also known as Amish country. This painting reaches back to the time of the earliest settlers and pays homage to New England’s colonial history. Although this church was not built until 1860, the Center Methodist Episcopal Church is in the English Baroque style, a style commonly associated with Sir Christopher Wren, a seventeenth-century British scientist, mathematician, and architect. Wren started dabbling in architecture in the 1660s, ultimately designing fifty-one churches for the city of London after the Great Fire of 1666 destroyed most of the city. Although, this isn’t a direct copy of Wren’s style, it is a more modern interpretation of the architect’s infamous style. Scofield Thayer, writer, editor, and co-owner of the avant-garde literary and art magazine The Dial, bought this work from Demuth in 1921. Known for his collection of particularly haunting works by Egon Schiele and Gustav Klimt, he also maintained a collection of works that had been featured in The Dial, which were on extended loan to the Worcester Art Museum from 1931 to 1982. However, much to Thayer’s chagrin, the good people of Worcester did not appreciate his art collection – so much so that he pledged to ultimately give it to the Met as early as 1924, though the bequest did not happen for another sixty years. Arnason, H.H., and Elizabeth C. Mansfield. History of Modern Art . Upper Saddle River, NJ: Pearson Education, Inc., 2013. BBC. “Sir Christopher Wren (1632 - 1723).” Historic Figures. History. http://www.bbc.co.uk/history/historic_figures/wren_christopher.shtml. Accessed February 20, 2019. Provincetown History Preservation Project. “History of the Provincetown Heritage Museum.” Archives. http://www.provincetownhistoryproject.com/archives/5181. Accessed February 20, 2019. The Metropolitan Museum of Art. “After Sir Christopher Wren.” Collection. https://www.metmuseum.org/art/collection/search/483297. Accessed February 20, 2019. The Metropolitan Museum of Art. “Movement No. 5, Provincetown Houses.” Collection. https://www.metmuseum.org/art/collection/search/488487. Accessed February 20, 2019. Zion, Amy. “The Collector’s Desires: Spotlight on the Scofield Thayer Collection.” Blouin Artinfo. August 24, 2018. https://www.blouinartinfo.com/news/story/3221097/the-collectors-desires-.... Accessed February 20, 2019. © 2012 - 2019 Sartle. All Rights Reserved. No part of this website may be reproduced without Sartle's express consent.